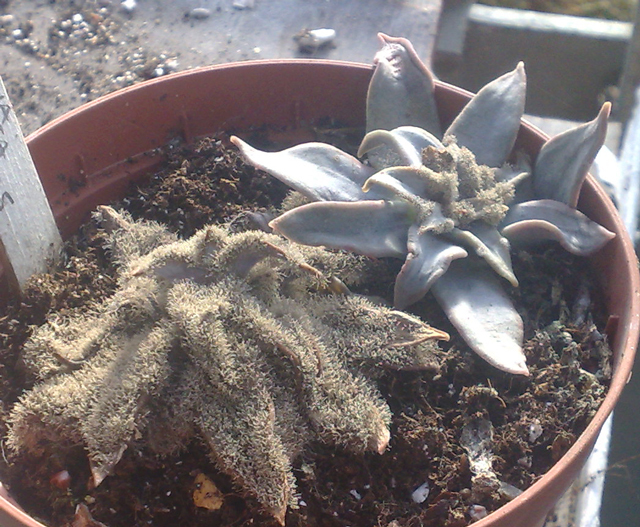 This disease is found predominently in succulents which have more soft, fleshy succulent parts. Infections usually begin on dead plant material, old leaves, flower stems etc. but if not checked will spread to healthy tissue. Water-soaked spots enlarge rapidly to encompass a large portion of the plant. When night temperatures are cool, day temperatures warm, and moisture conditions high, the pathogen readily produces spores, covering infected plants with dusty, greyish-green masses. The photos show two plants of Echeveria recurvata. The plant on the left has been totally destroyed, that on the right might be salveagable if a chemical spray is applied. There is also a mildew ( Plasmospora viticola ) which mainly attacks Euphorbiaceae and Asclepiadaceae grown in a greenhouse under cool and moist conditions. The top of the stems are covered with a thin white felting, leading to brown patches. Grow plants in good light, with plenty of air circulation. Allow the soil to dry out between waterings. Keep humidity low. Remove dead leaves, flowers etc. regularly to remove food/hiding places for pests and disease. It helps to water the soil from below, to avoid wetting the plant. If this is not possible, then water early in the morning to allow the plant surface to be dry overnight. Remove all infected material. Reduce humidity. A spray containing Captan or Benomyl may be applied evenly to the plant surface.